Dar Al-Tifel Al-Arabi Boarding Section was established in the year 1948 by the late Ms. Hind Al-Husseini after the well known massacre that happened in the village of Deir Yassin by the Israeli gangs. Ms. Hind Al-Husseini took the responsibility to sponsor and to provide care and shelter for 55 children; those who were the kids of the Palestinian martyrs killed in that massacre. She tried her best with the help of her friends to secure the needs of those desperate children so as to live in dignity. She was able to provide them with food, clothes, proper accommodation, etc. In the first stages of establishing Dar Al-Tifel Al-Arabi Organization, the children used to sleep in Ms. Hind’s house. However, the number of the needy children increased rapidly. The Organization could not manage to help them all, as there was not enough money or resources. The late Ms. Hind Al-Husseini tried her best to contact Palestinian, Arab and foreign benefactors and donors. Despite the hardships and through the help of her friends and the good people she managed to expand and develop the Institute to include lands and buildings. She managed to purchase lands and register them as Wakf for the benefit of Dar Al-Tifel Al-Arabi Organization, on which the buildings of the Boarding Section and the School were established. Moreover, she managed to purchase two historical buildings, one that serves as a museum for the Palestinian Heritage and the other was Dar Isaaf Al-Nashashibi for Culture, Arts and Literature. In addition to Ms. Hind’s own house which is now the administration building of the Organization. 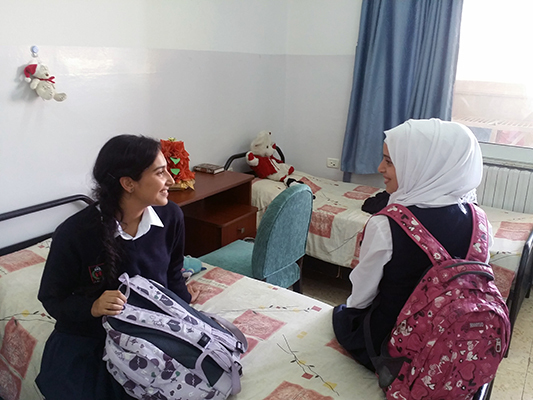 The Boarding Section can shelter up to 300 female Palestinian orphans, social and financial cases. However, the recent Israeli boarders and checkpoints in addition to the illegal Israeli wall prevents many Palestinians of the West Bank and Gaza from being able to enter Jerusalem and benefit from the Organization’s services. This made the number of the Boarding Section’s residents decrease sharply to reach 19 students only for the recent scholastic year 2010-2011. The section is administered by a qualified educator and her team that consists of 5 teachers (substitute mothers) and 2 cooks. They are responsible of securing all the needs of the Boarding Section students. The Organization provides the boarding students with free accommodation, health and psychological care, education and recreation. After the departure of Ms. Hind the Organization has not stopped from moving on and developing, preserving its mission and providing its social and educational services to all who need them.